Once again, Thailand comes up trumps with an easy long-weekend getaway from Hong Kong. Khao Sok contains the oldest rainforest on the planet, and together with Klong Saen and Klong Nakkha wildlife sanctuaries, and the smaller adjacent parks of Sri Phangnga and Klong Phanom, it encompasses a huge protected area of 4,400km² – four times larger than the whole of Hong Kong’s territory. What that means for us, is that there’s a great big national park about 2.5hours drive from Phuket airport where we can go to play. I first visited Khao Sok back in 2004 and in the intervening six years, it’s barely changed – which is both surprising and gratifying. There are a few more guest-houses and a couple more places to get a (pretty poor) massage, but not much else. Khao Sok is about 2.5hrs drive north of Phuket, and about 1hr north-east of Khao Lak and an hour or so west of Surat Thani. For visitors, it’s split into two parts. The settlement around the park headquarters along the Sok river where all the guesthouses are and from where you can trek into the forest, and then Cheow Lan Lake in the north where you can go and stay in raft-huts. Cheow Lan Lake was formed when the Rachabrapah Dam was built in the early 80′s. A blessing and a curse, as most large hydroelectric projects are, the lake covered a huge area of virgin rainforest, causing massive harm to the local wildlife and has made the most remote parts of Khao Sok accessible to rampant poaching. It does, however provided sporadic supplies of electricity, and is absolutely one of the most awe-inspiring landscapes I’ve ever visited – beats both Halong Bay and Phang Nga Bay on that front. Glam it most certainly is not, but awesome it is, young grasshopper. For a Brit, one of the bonuses of spending so much time in sub-tropical Hong Kong is that when it comes to holidays I do not need to head for the beach to get some sun in my bones. Khao Sok is a real all-year-round destination. But if you were splitting hairs, I’d say the best time is on the cusp between the wet and dry season so that the reservoir is full, the waterfalls gushing, but you’re guaranteed some sunshine, and hopefully when it’s not too busy. I like the rainy season personally, but I’m a contrarian. Getting there – Driving is the only sensible option. Most tourists visit Khao Sok as an organised 2-3 day trip from Phuket, or are backpacking through as it is on the trail and it can be super cheap. This means that 99.9% of visitors have to take part in organised activities which mostly have to stick to the same schedules. Either fly into Phuket or into Surat Thani, hire a car and drive up. The roads are beautiful, it’s very easy to find, and the scenery is spectacular. You’ll also be able to stay in the best hotel – The Cliff and River – and make your own itineraries, which is highly preferable. 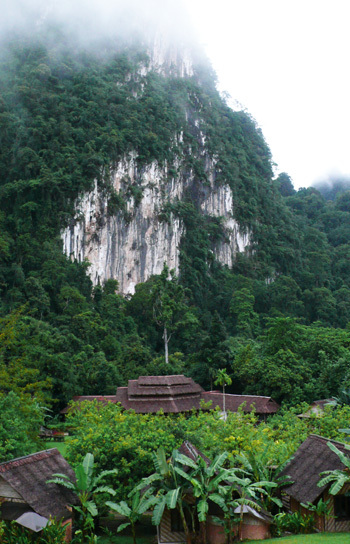 Get a hold of Waterfalls & Gibbon Calls - Exploring Khao Sok National Park by Thom Henley. Whether you do this when you arrive at Khao Sok or manage somehow to get a hold of a copy pre-arrival, it’s really worth reading before you decide how you want to spend your time in the park. Plus, a percentage of the cash goes to a children’s educational trust. Tells you all about the flora, fauna and history as well as having a rundown on the places to stay and eat. Invaluable. You can either have a spin round the village and take a look at all the different bungalows on offer, or you can just choose out of the ones I think are the best options. If you have to stay around park HQ, then I would recommend The Khao Sok Rainforest Resort. It has a few “mountainside” bungalows set up a hill that look out over a bit more scenery than most of the bungalows which are at ground level. It’s also run by one of the best guides in the park – a poacher turned gamekeeper who will take you on some great treks, hacking his way through the forest with his machete. They have good food, and really the only reason to choose The Cliff and River over this is that The Cliff is more stylish and has air-con. We also stayed at Las Orquideas for one night, which was new, neat and tidy and run by a very friendly Spanish chap and his Thai wife. There’s only a handful of bungalows and it’s quite a way away from both headquarters and the main restaurant area. He’s planted some beautiful gardens, but with a THB1500 price tag, I’d take The Cliff at THB2000, or the Rainforest Resort at just THB600 instead. Sorry, but you fall between two stools. If you want something a bit more special though, there’s only one option: The Cliff and River, about 10-15mins drive from the park entrance. This is where a car comes in handy again. You’d be completely reliant on this hotel’s facilities and activities if you didn’t have your own transport which, in all honesty, you don’t want to be. The bungalows c1-c5 are some of the best, being up the hill halfway between the restaurant (downhill), the spa and reception (up-hill) and a few footsteps away from the lovely swimming pool/jacuzzi. But most important are the stunning views of a sheer karst cliff rising hundreds of feet above you. Breathtaking. The rooms are large, have air-con and TV. They have lovely terraces and cute little indoor/outdoor bathrooms. Well worth the THB2000 per night. Take note: This is a pretty new concern. Service is friendly but a bit haphazard, and they only take cash. In the low season, they don’t have many staff, so it’s more difficult to organise massages etc (we turned up for our pre-booked massages only to be told that there was just one therapist so we’d couldn’t have them simultaneously, which kind of defeated the purpose of booking). All of the accommodation includes breakfast in the price, and as usual the breakfast is pretty darn generous and tasty in all of these hotels. It seems there are only two restaurants that are not part of a guesthouse complex. One is Thai Herb, the other is Pawn’s. Thai Herb is a pretty good little restaurant. It’s set on stilts on a couple of different levels and is surrounded by a very pretty garden. The food was good and it was shooper cheap. Definitely recommended. You can go kayaking or inner-tubing down the Sok looking for wildlife and spinning out of control. You can follow the trails by yourself through the park or hire a guide to take you off the beaten track. If you haven’t tried it, inner tubing is great fun. It’s not just for the backpackers in Laos, grown adults are allowed to enjoy it too! Next time we go back we are going to go and do a bit of jungle survival with a couple of likely-looking guerrilla types for 4-5 days living off the land, and weaving our own hammocks etc – all very Ray Mears. I have to say I was a bit offended when one of the guys pointed at me and said, “Of course if your girlfriend comes we’ll have to only do maybe 50%. Not 100%.” Caustic Candy then set him straight by dislocating his shoulder in one smooth movement and telling him the story of how she lost her eye and what happened to the perpetrator of that attack. I usually delight in chauvinism and use it against them as it makes men foolish and incautious, but as I wasn’t working I thought I could show my hand and teach this little scalawag a lesson. There are also options to go trekking by elephant if that’s your thing. I’m still confused about whether it’s a good or a bad thing for the lovely Lelfants, so I tend to steer clear myself. The world is a complicated place sometimes. Wild animals are obviously pretty shy and the locals say that the rise in tourists has driven many of the animals deeper into the park. Don’t go expecting to see tigers and bears, but do expect to see their traces if you go hiking off trail. We saw big cat paw prints and evidence of bears sharpening their claws on tree trunks. We heard and saw gibbons and macaques, countless snakes and insects as well as eagles, hornbills and lots of other birds. You definitely hear more than you see, but for me that’s the magic of forests and jungles: the sitting and the listening. We also went to see the Rafflesia, but frankly I was more concerned I might step on one the new buds hidden in the mulch, and decided that maybe it was better to see some things on the TV, and that I didn’t really need to experience all the wonders of the world up close, if it meant I might hasten their extinction. Poaching is still a big issue with trapping rather than hunting being the modus operandi. I’d happily pay THB1000 a day for a permit to visit if it meant more rangers could patrol. The permits are only THB200 right now which is very generous. So. Lots to do and much cheapness. It’s all sounding good for Khao Sok so far. And now, any trip to Khao Sok should really include a visit to Cheow Lan Lake, but as this post is now getting a little long, I’ll tackle that separately. What a wonderful post! Makes me want to hop on the next flight out! Do you think this would be a good place to take little ‘uns? Mine are 4 and 6, and while they love beaches, I’d like for them to do something a bit different in Thailand. Thanks so much! We always rent a car in Phuket anyway, and we’ve driven all over the place, including down to Krabi… turning left after the bridge will be something new.